Is it weird that I actually dig this oil's savory, clove-like scent? 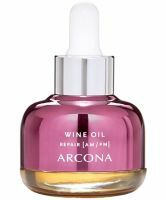 This face oil leaves my skin so soft and supple the morning after I wear it -- above and beyond what many other face oils deliver. They really ought to call this clove oil, since that's the overwhelming scent, and is bound to be a disappointment to anyone like me who hoped for a spa-vineyard-y scent. That said, I sucked it up and used it a few nights in a row and could not believe just how ridiculously soft this made my skin. It's not a bad price for a face oil, either. I didn't mind the smell of this face oil, and it felt nice when I applied it to my skin. But honestly? Even though it was hydrating, it was TOO hydrating because it left my face feeling slick and greasy. Which is a no-go for me.